House Dust Mite-Induced Asthma | Chondrex, Inc.
Asthma is caused by exposure to allergens such as dust mites, pet dander, pollen, or mold, and is characterized by airflow obstruction and bronchospasm. Of these allergens, house dust mite (HDM) is the most important indoor allergen for humans (1, 2). Two main mite species, Dermatophagoides pteronyssinus (D. pteronyssinus) and Dermatophagoides farinae (D. farinae) are the major allergens responsible for asthma in human allergy patients. To develop a mouse asthma model that closely resembles human allergic asthma, Chondrex, Inc. provides purified HDM extracts from both D. farinae and D. pteronyssinus that are ideal for inducing allergic asthma in mice. Chondrex, Inc. also provides Anti-House Dust Mite Antibody Assay Kits, Cytokine Detection Assay Kits, and Chemokine Detection Assay Kits that can be used to monitor progression of the model and to determine the effects of any experimental therapeutics. We also provide a Der p10 Detection Assay Kit and a Trypsin Activity Assay Kit to determine the allergen levels and total proteinase activity levels. To learn more about the House Dust Mite-Induced Asthma Model, please continue to the Table of Contents below. If you have any questions about the model, please contact us at support@chondrex.com. The development of novel therapeutics for asthma requires appropriate animal models that can reliably reproduce many aspects of human asthma: airway hyperresponsiveness (AHR), reversible airway obstruction, early and late asthmatic responses, airway remodeling, and eosinophilia. Traditionally, ovalbumin (OVA) has been used to induce both acute and chronic experimental allergic asthma in mice. However, OVA is not a clinically relevant allergen and the in-vivo sensitization process with aluminum adjuvants is drastically different from humans sensitized by allergens only. Therefore, researchers have turned to using clinically relevant allergens, such as HDM. Furthermore, because HDM is an immunologically complex allergen, HDM can stimulate both the innate and adaptive immune responses. HDM-Induced Allergic Asthma more closely resembles the heterogenous nature of human allergic asthma than the traditional OVA-Induced Asthma model. Evaluating experimental therapeutics using the HDM-Induced Allergic Asthma model could lead to new options for asthma patients whose symptoms are not well managed with current treatment options. HDM extract, especially from the main two species: D. pteronyssinus and D. farina, is the most important indoor allergen in humans (1-3). HDM contains over 20 types of allergens identified based on sequential and functional homologies. Among those HDM allergens, group 1 (Der 1) and group 2 (Der 2) are the dominant allergens that induce immune-responses in patients and are the most commonly researched allergens (1, 4-6). Group 1 allergens (Der p 1 and Der f 1) are cysteine proteases which can cleave tight junctions and increase the permeability of airway epithelium. This proteolysis increases the likelihood of allergen recognition by the underlying antigen-presenting cells, inducing pro-inflammatory responses. Asthma induction especially correlates with Der p1 proteolytic activities which can be measured with a chromogenic substrate using a trypsin assay (7). On the other hand, the amino acid sequence of Group 2 allergens (Der p 2 and Der f 2) has high homology with that of MD2 which is a co-ligand of lipopolysaccharides (LPS) that activates the innate immune-response by TLR4 signaling (1). Because HDM contains other HDM allergens in addition to Der 1 and Der 2, as well as bacterial and fungal products such as LPS and β-glucan (6), HDM can activate both adaptive and innate immune reactions without the use of an adjuvant. Therefore, HDM extract alone can be used for inducing experimental allergic asthma, unlike that of the OVA-Induced Allergic Asthma model which requires aluminum adjuvants. Many protocols have been published for inducing acute and chronic HDM asthma models in mice. 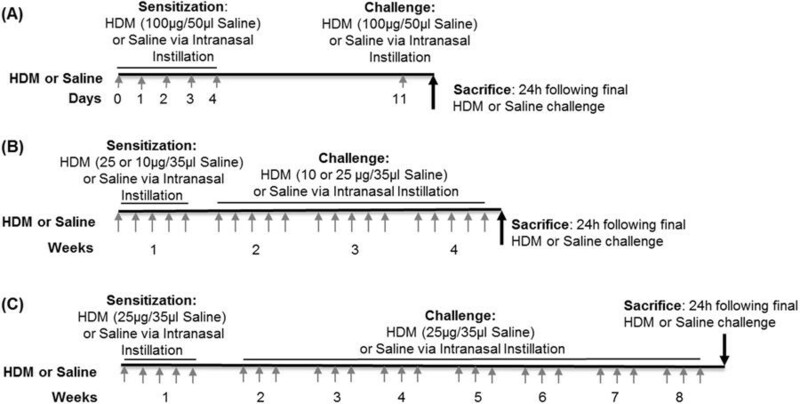 Figures 1-3 show sample protocols for allergen challenge procedures using different doses of HDM. 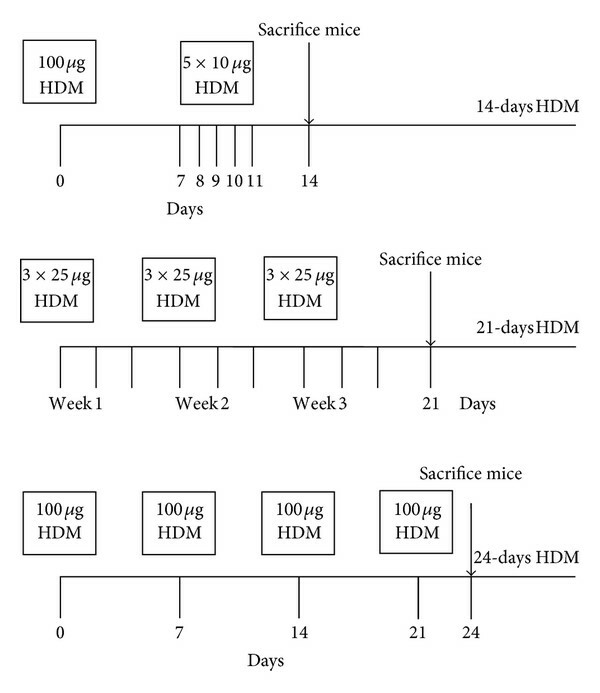 We recommend establishing and optimizing a protocol according to your study needs because the effective dose of HDM challenges depends on mouse strain, housing condition, and quality of HDM. In addition, prolonged exposure to HDM leads to remodeling of the airways with increased mucous cell density and AHR, which will remain elevated even after discontinuing HDM exposure (8). Figure 1. Acute challenge model of asthma using HDM extract (9). Figure 3. Alternative acute and chronic allergen challenge models using house dust mite extract (11). The House Dust Mite-Induced Asthma Model can reproduce many aspects of human allergic asthma. However, the disease phenotype of the HDM-Induced Asthma model may vary due to study conditions such as mouse strain, HDM quality, and challenge protocol. Therefore, selecting disease evaluation methods is an important tool for evaluating disease severity and therapeutic effect. High levels of serum anti-HDM IgE antibodies are required to develop the HDM-Induced Asthma model. However, in contrast to both OVA models and human asthma, IgE response in HDM models tends to be weak (8). Regarding anti-HDM IgG levels, anti-HDM IgG1 antibodies are associated with Th2 responses, while anti-HDM IgG2a or IgG2b antibodies are associated with Th1 responses (9). Therefore, measuring the antibody levels of anti-HDM IgE and IgG can be useful for determining effective sensitization and treatments. Chondrex, Inc. provides Mouse Anti-House Dust Mite Antibody Assay Kits and Mouse Total Immunoglobulin Assay Kits to quantify specific subtypes and subclasses of antibodies against HDM in mouse samples. Successful asthma induction leads to higher levels of Th2-related cytokines (IL-1 alpha, IL-4, IL-5, and IL-13) and asthma-related IL-33 (11-13). Additionally, quantifying chemokine levels, such as CXCL16 and CCL20, CCL2, CCL5, and CXCL8 can be useful to determine the disease modifying effects of experimental therapeutics (12, 14). Chondrex, Inc. provides Mouse Cytokine Detection Assay Kits and Mouse Chemokine Detection Assay Kits. Successful asthma induction in the HDM-Induced Asthma model will increase immune cell counts of neutrophils, eosinophils, lymphocytes, and macrophages in bronchoalveolar lavage fluid (BALF) . In addition, airway hyperresponsiveness (AHR) increases during disease progression (11,15). L. G. Gregory, C. M. Lloyd, Orchestrating house dust mite-associated allergy in the lung. Trends in Immunology. 32, 402–411 (2011). V. D. Gandhi, C. Davidson, M. Asaduzzaman, D. Nahirney, H. Vliagoftis, House dust mite interactions with airway epithelium: role in allergic airway inflammation. Curr Allergy Asthma Rep. 13, 262–270 (2013). M. Masoli, D. Fabian, S. Holt, R. Beasley, G. I. F. A. G. Program, The global burden of asthma: executive summary of the GINA Dissemination Committee report. Allergy. 59, 469–478 (2004). W. R. Thomas, W. Smith, House-dust-mite allergens. Allergy. 53, 821–832 (1998). A. CUSTOVIC, S. C. Taggart, H. C. Francis, M. D. Chapman, A. WOODCOCK, Exposure to house dust mite allergens and the clinical activity of asthma. Journal of Allergy and Clinical Immunology. 98, 64–72 (1996). A. Jacquet, The role of innate immunity activation in house dust mite allergy. Trends in Molecular Medicine. 17, 604–611 (2011). L. Gough, O. Schulz, H. F. Sewell, F. Shakib, The cysteine protease activity of the major dust mite allergen Der p 1 selectively enhances the immunoglobulin E antibody response. J Exp Med. 190, 1897–1902 (1999). S. Sagar, H. Akbarshahi, L. Uller, Translational value of animal models of asthma: Challenges and promises. European Journal of Pharmacology. 759, 272–277 (2015). M. A. M. Willart et al., Interleukin-1α controls allergic sensitization to inhaled house dust mite via the epithelial release of GM-CSF and IL-33. J Exp Med. 209, 1505–1517 (2012). C. Draijer, P. Robbe, C. E. Boorsma, M. N. Hylkema, B. N. Melgert, Characterization of Macrophage Phenotypes in Three Murine Models of House-Dust-Mite-Induced Asthma. Mediators of Inflammation. 2013, 1–10 (2013). L. N. Woo et al., A 4-Week Model of House Dust Mite (HDM) Induced Allergic Airways Inflammation with Airway Remodeling. Sci Rep. 8, 6925–121 (2018). Y. Li et al., Kinetics of the accumulation of group 2 innate lymphoid cells in IL-33-induced and IL-25-induced murine models of asthma: a potential role for the chemokine CXCL16. Cell Mol Immunol. 16, 75–86 (2019). J. Choi et al., Picroside II Attenuates Airway Inflammation by Downregulating the Transcription Factor GATA3 and Th2-Related Cytokines in a Mouse Model of HDM-Induced Allergic Asthma. PLoS ONE. 11, e0167098 (2016). S. Post et al., ADAM10 mediates the house dust mite-induced release of chemokine ligand CCL20 by airway epithelium. Allergy. 70, 1545–1552 (2015). H. Piyadasa et al., Biosignature for airway inflammation in a house dust mite-challenged murine model of allergic asthma. Biology Open. 5, 112–121 (2016).